Contains excerpts from "Glassy Sky" produced by Yutaka Yamada and lyrics by Lisa Gomamoto and Norio Joseph Aono. Used by permission and courtesy of Marvelous Inc. All Rights Reserved. 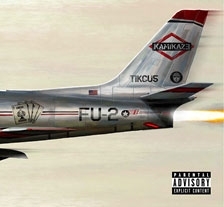 Rolling Stone - "The rhymes have more grace and torque than the scream-raps of his last LP, 2017's REVIVAL..." NME (Magazine) - "[T]here are plenty of moments on KAMIKAZE that remind us of Em's greatness: the shift in flow on 'Normal', the haunted beats and clipped chorus of 'Greatest', the Bon Iver-sampling 'Fall'."